With thanks to Derek Swindell, Tony Lester, Alan Perry and Clifford Raven for names, photographs and general information. Back Row L to R: ?,?, Alf Leafe, ?, Jimmy Holmes, Joe Perry, Jack Haslam,?, G.Lynam. Seated: L to R Will Barnes, ?, ?, Mr Kneebone, Sam Hollinsworth, ?, ?. Second left is Sam Hollinsworth who conducted Crich Brass 1952 – 53. He was a very good tenor horn player who also used to play for the famous “Besses o’ the Barn Band” from Lancashire when they were at their best. He went on tour to Australia and New Zealand with them and won many solo contests. Taken in 1952 outside the Baptist Chapel. Crich Brass leading a parade down Bownes Hill. 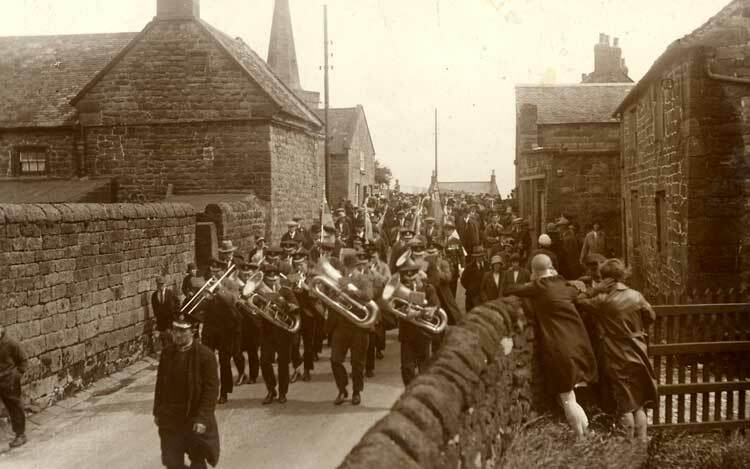 Crich Brass leading a parade along the Common past the Kings Arms on the right and Coop on the left. Crich Brass leading a parade towards Town End. 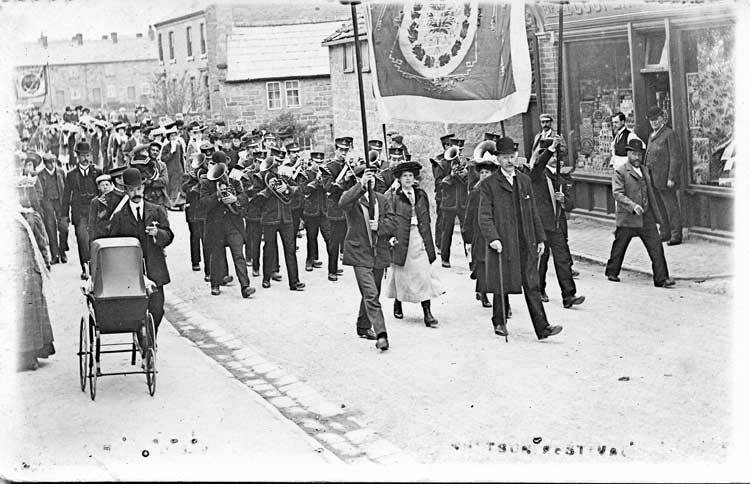 Crich Brass leaving Town End (not in uniform) on a Derbyshire Infirmary March. 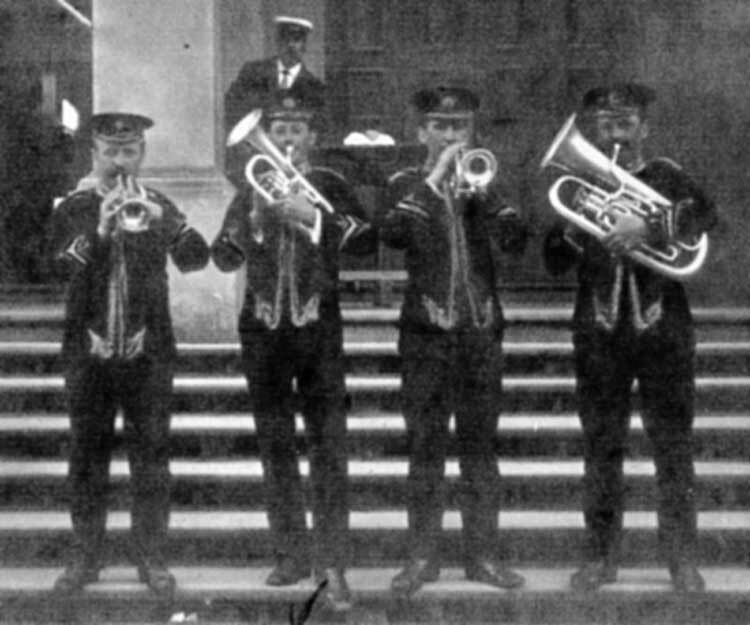 Crich Brass on 25 May 1931 outside the church. Diminutive conet player off-centre is Joe Perry. 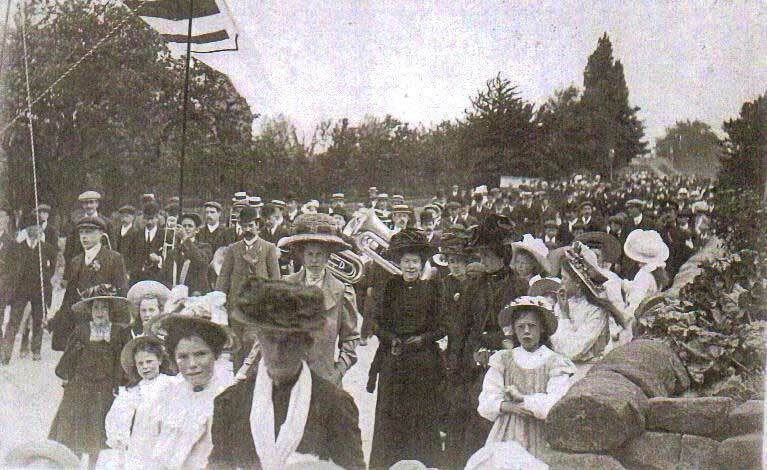 The Wakes Parade down the Common about 1909. Ladies in black are of the Perry family in mourning for father Henry. 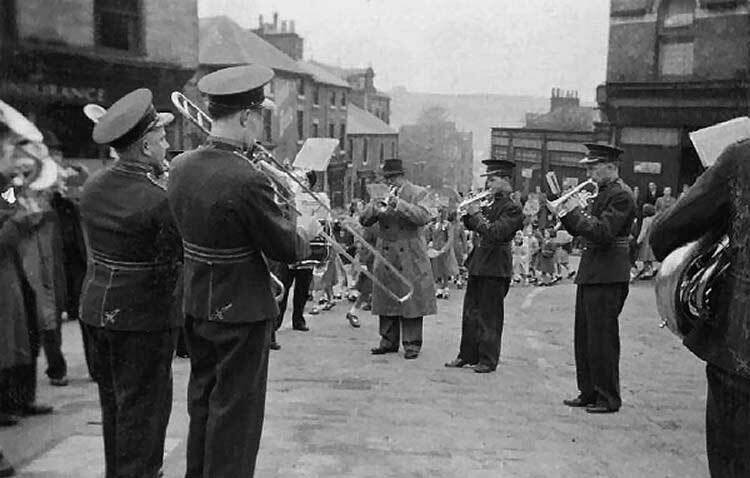 Crich Brass Band playing at Belper in the 1950s. The late F.E. 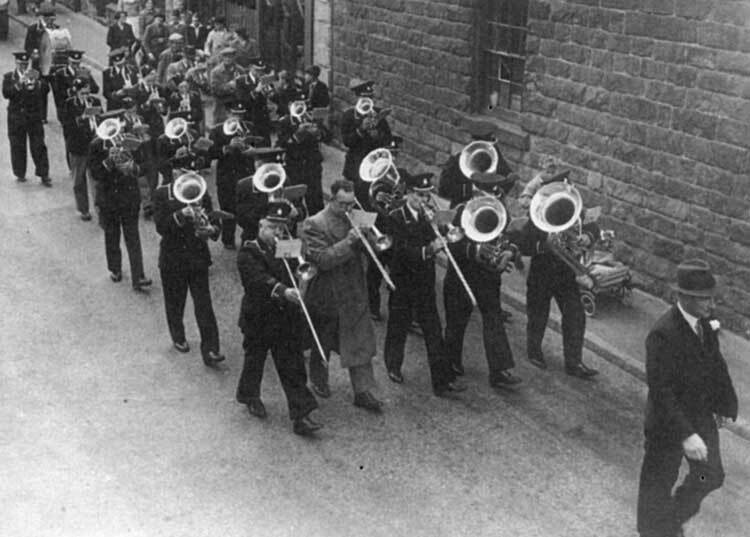 Ashman leading Crich Band past Allsop's bakery in the 1950s. Front: Jack Else, Jim Garrity, John Burnam, Ernest Mason, ? Row 3: Arnold Morley, Alf Leafe, Albert Swindell, ?, ? 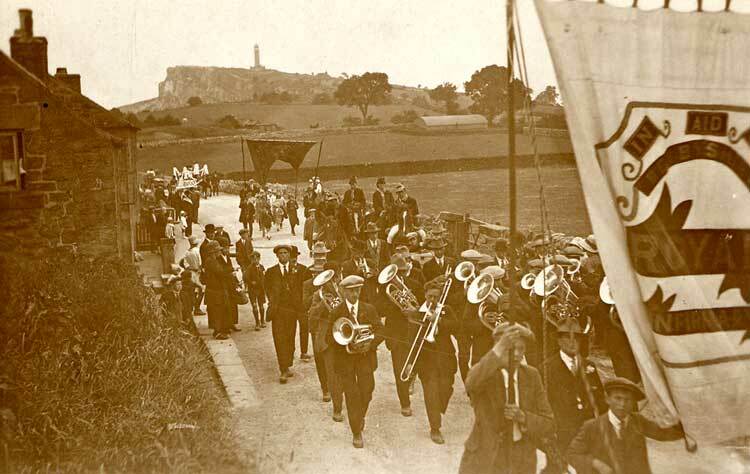 My earliest recollection of Crich Band was following behind it in the Whitsuntide walks before the 1939-45 war. My real interest came after the war when the band was reformed. Around a dozen of 'us lads' started going to practice in the Parish Room on a Sunday morning and down to Mr Albert Swindells, at Chapel Lane on week nights. After some while we were allowed to go on parade and on engagements. 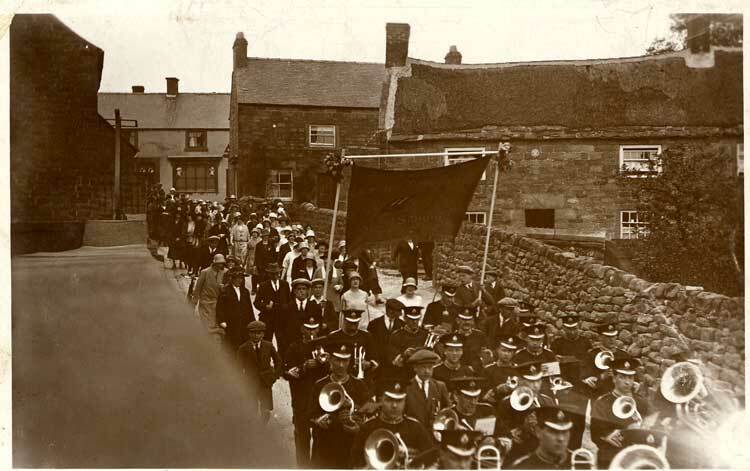 The conductor at that time was Mr George Haslam, the village Blacksmith, who, when on parade, played the trombone. We were kept pretty busy with concerts at places like Ripley, Belper, Matlock Bath, Hall Leys, Derby Parks, Ashbourne and Burton. 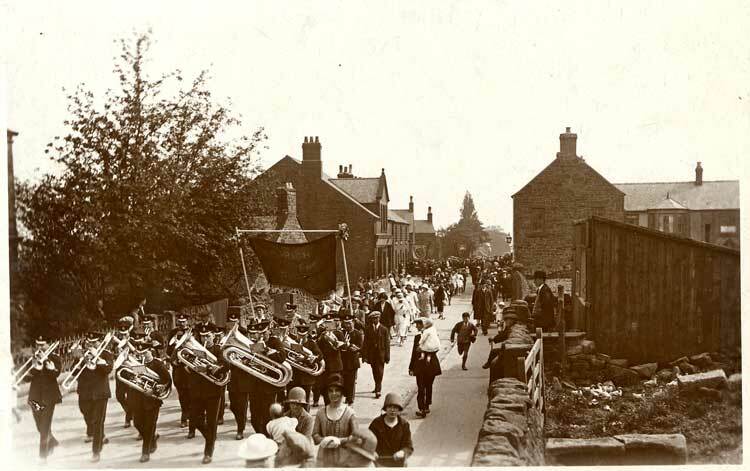 Apart from parades at Crich, we led carnivals and sermons round the district. We also played at the Venetian nights, when they started up after the war. We played carols round the village on Christmas morning. 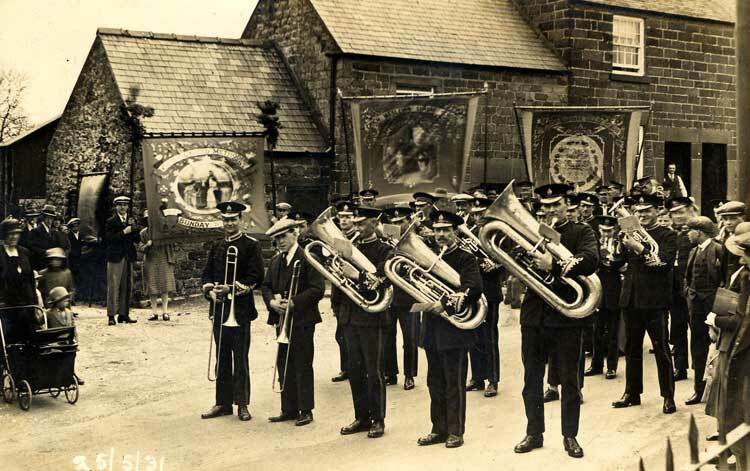 The proceeds - of which were divided up between the bandsmen and "collectors", around £1 each, not forgetting old Bill Holmes, who always had an ounce of tobacco, he used to put the stands up for practices etc, and came on all the jobs. I can only remember two young ladies being in the band, Barbara Haslam, now employed at the Crich Health Centre, and years later Colleen McArthur, a pupil at Strutts. On the earlier 'jobs', we went to Ashbourne several times in Mr Des Sellors lorry. It had a tarpaulin cover on with wooden benches for seats. He used to convey Italian RO.W. 's about from Heage. Later it was Gervase Taylors (has anyone paid twice) lady coach. Some members used to travel quite a distance. 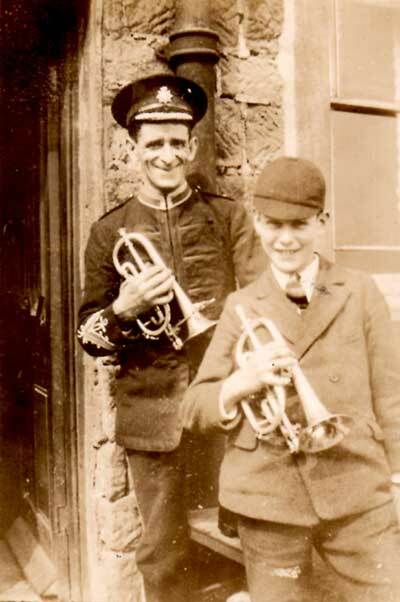 Harry Harper used to carry his Euphonium (no light weight) to practice from Ridgeway, Arnold Morley biked from Belper with a baritone on his back. Joe Perry and Ernest Mason came from Whatstandwell. In later years, four or five came by taxi from Wirksworth. The next conductor was Mr Griff Martin, who had relatives at Fritchley I believe. I think Mr Sam Hollingsworth was the next one, a champion tenor horn player and a member of the 'Besses o'th Barn' Band, going on a tour to Australia with them. We went to our first post war contest under Mr Hollingsworth in March 1953. The Daily Herald Midland area at Nottingham, I think we came about fifth place. A man who influenced my banding interests was Mr Jack Else - solo trombone player. He took me down to London to the finals at the Albert Hall, along with Mr Dennis Else (himself not a player), but a great lover of bands, with a very dry wit, who had us in stitches with his views about the "vice etc." in the big city, this was in the early 1950s. Mr Else also took me 'guesting' with other bands in the area. 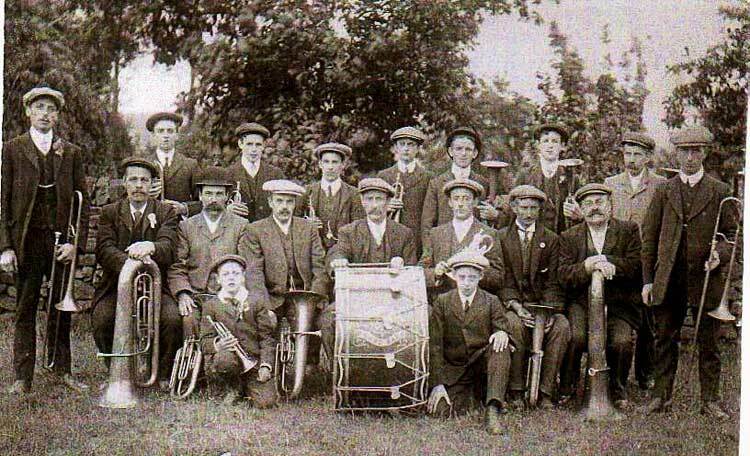 The president of the band was Mr Percy Taylor, a local butcher, who was later followed by his son Horace. Mr Alf Leafe was the secretary after the war and then Mr Colin Fantom took over. The band had an active ladies committee, who raised funds with whist drives, dances and raffles etc. Mr Else once told me the band used to play for it's own dances and others (pre war), called the Silver Six. Around 1951, it was decided we would obtain new uniforms, so fundraising started. The old uniform was a little bit out of date by now and some members had remnants, some none at all. It was a plum colour with gold trimmings and had a 'dog collar' which resulted in many sore necks when the weather was warm on parades. The new uniform was acquired in 1952 and worn on a parade to church and an evening concert on the market, a double breasted jacket with ties. Very smart at the time, the young lads had blazers and 'chip bag' hats. Mr Jimmy Holmes (solo cornet player) was the next conductor. I then had a break for three years, whilst in the R.A.F. and so couldn't comment on this period. We had several band trips to Bridlington etc. and an annual band dinner. 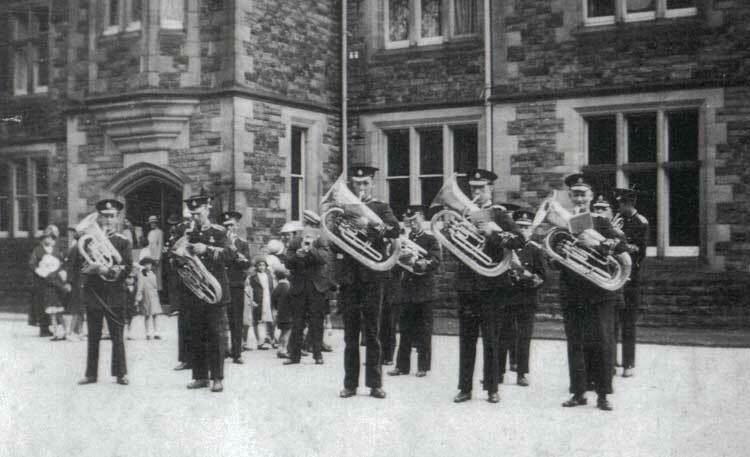 Around 1958 (I think), we were parading around Whatstandwell for the sermons and we finished in the old campfield. A man and his family were camping and he heard us. He came from Derby and his name was Bill Maudsley. He got talking to some of the band and the outcome was that he came to the next practice to conduct us. It appeared he was a good cornet player with the Bickershaw Colliery Band up until the war and he gave our band a new lease of life. He improved the playing and started talking about going to contests. He took four of us to Quartet Contests and also introduced new music to us. The first contest he took us to was at Leicester (early 1960s), then followed three more,at Edwinstowe, Derby and Blackpool. The last was around April 1962. Some of the older players had finished and the younger ones were not coming along. Armistice day came, and we had about ten players turn up, not enough to play, so we walked up to church without playing a note. Later that year on Christmas morning only three or four turned up to play! 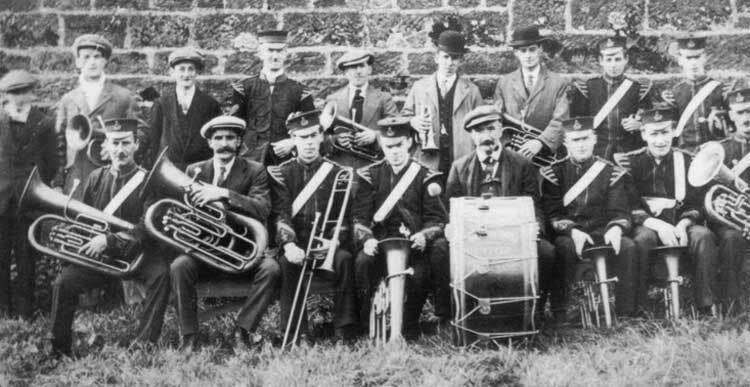 I was asked to go and play with Stanton Works Band, near Ilkeston, so I am afraid my ties with Crich Band were broken. I am not sure when the band finally finished. The old committee: C. Fantom, J. Perry, T. Longdon, D. Wetton, A. Swindell and myself met in later years to officially wind the band up. Doug Wetton, I believe, still goes playing at Wirksworth. A. Swindell, until recently was playing with the City of Stoke Band. Dawson Longdon still has a 'blow' at home. We still go to listen at contests etc. I still get great pleasure from listening to my collection of records, tapes and now C.D.'s. 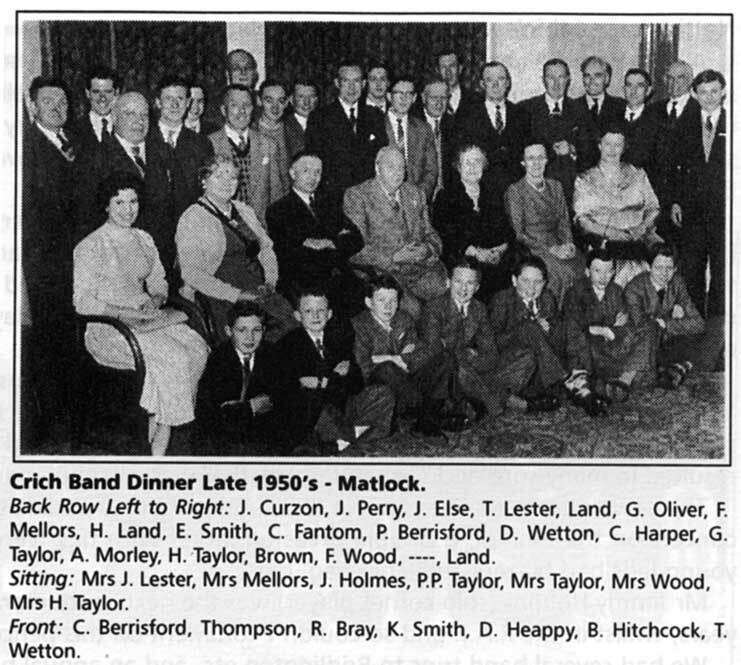 I have still got a recording of Crich Band from around 1961. 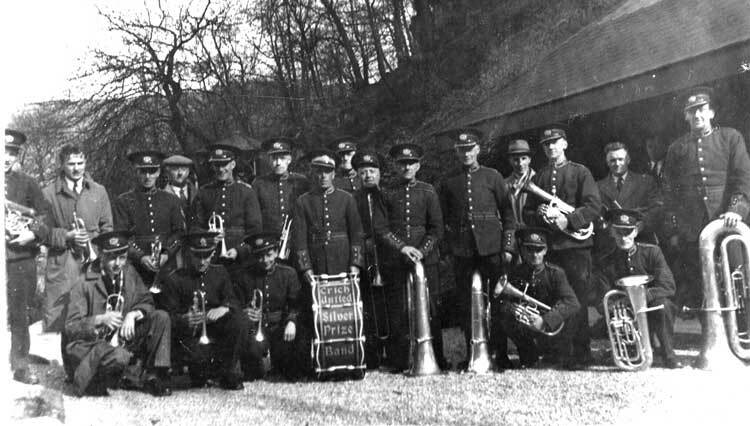 Between 1952 and 1953 Crich band changed its uniform from the plum colour with dog-collar necks (uncomfortable) to the one on the right. Photograph shows Tony Lester with brother Michael. Listen to Crich Silver Prize Band play "Abide with Me & Mary's Boy Child"